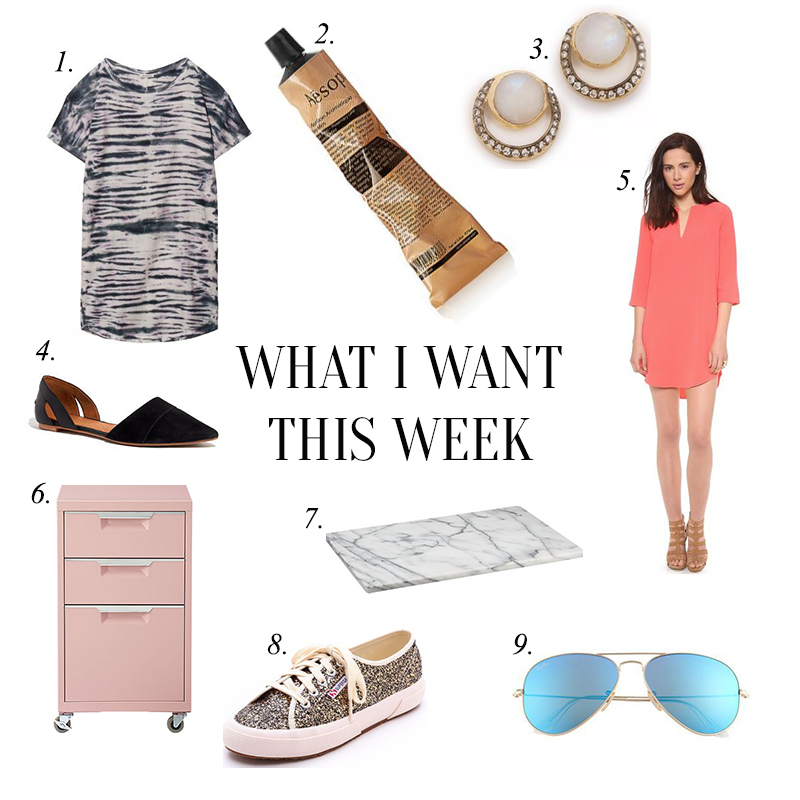 this week’s wishlist is a bit all over the place. there’s a comfy tie dye t-shirt dress that’s perfect for spring (and would look great with a leather moto jacket), a pair of d’orsay flats from madewell that give the look of jenni kayne without the price tag, a marble pastry board that will pretty up my food posts (the fugly granite in my kitchen does me no favors), a pair of sparkly supergas that ring in at just $70 buckaroos, and the cutest filing cabinet i’ve ever seen. i’m still trying to figure out if i can pull off reflective sunglasses, and i’m pretty sure that bb dakota dress above isn’t exactly suited for my body type, but hey, a girl can dream, right? also on the list: adorable earrings, and a cult favorite hand cream. i’ve yet to make it to the aesop store in soho, but now that i’m working in the neighborhood, i think a trip there is in order. my crackly gross hands (that, no joke, were so bad that my manicurist scolded me. scolded me!) could benefit from some loving now that winter seems to have finally released us from her grasp. in other happy news, tomorrow is friday, i have the day off (!!!) thanks to a “comp day” my wonderful boss gave me in exchange for working through the weekend a few weeks ago, and i’m getting my hair cut (shorter, please!). hip hip hooray for the weekend!